Condition. Many times a home is not ready to sell, and a seller may need some guidance. 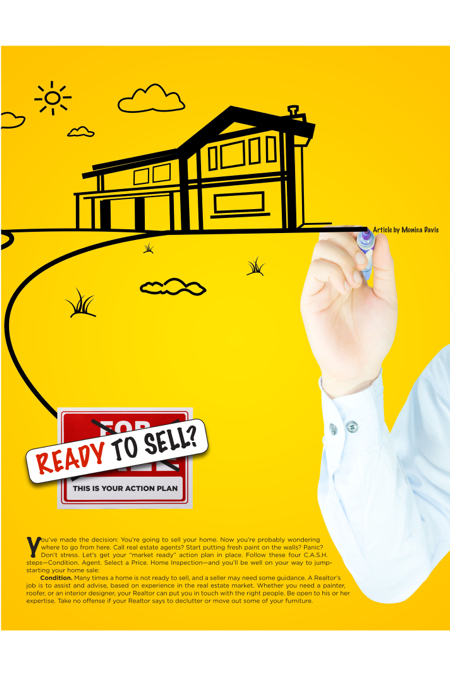 A Realtor’s job is to assist and advise, based on experience in the real estate market. Whether you need a painter, roofer, or an interior designer, your Realtor can put you in touch with the right people. Be open to his or her expertise. Take no offense if your Realtor says to declutter or move out some of your furniture. Agent. As you’re getting your house in order, start the hunt for a real estate agent. You’re not looking for just any agent; you need a coach to get you to the finish line. Put the word out to your network. Once you have some referrals, get to know each Realtor’s selling style. It’s worth the time investment to find the right agent. When a seller accepts an offer, there is much work for the homeowner and Realtor including a home inspection, appraisal, financing, and a CL100 (termite inspection) to be performed. Your Realtor will be involved in this process and communicating with you to make sure you are headed towards a successful closing. Selecting a price. Pricing is of utmost importance in this market, especially if there is plenty of inventory in your neighborhood. A Realtor should provide you with comparables of properties that are active in your area in addition to anything that has sold or is pending. There is much more to the decision than just putting a price on a house or a villa. Make sure your Realtor offers a comprehensive package, defining what they will do from the time they list your property until it closes in regard to marketing, advertising, open houses, and receiving feedback. Home inspection. If it’s a buyer’s market, consider scheduling a prelisting inspection. Nothing gives buyers the warm fuzzies more than seeing a completed inspection with items already attended to and checked off. This inspection will put your mind at ease so that when you do receive an offer, you feel certain that it will not fall apart over any issues regarding repairs. Monica Davis is a Realtor with Charter One Realty & Marketing. Reach her at (843) 384-4473 or monica@monicadavis.com.